Not often seen on The Attic, here is a beautiful Ingraham cased Art Deco Emerson. The cabinet's shape is like that of a semi-violin design and has intricate multi-colored walnut veneer. Emerson introduced their "Miracle Tone Chamber" design for the speaker on the left side, which is very appealing, especially with the wrap around grille. Multi colored walnut further accents this gorgeous Emerson. With four inlaid horizontal black stripes, this is really quite a striking set. Way to go, Ingraham! This lovely cabinet has been refinished using the very finest toning and finishing lacquers, producing a gorgeous finish. 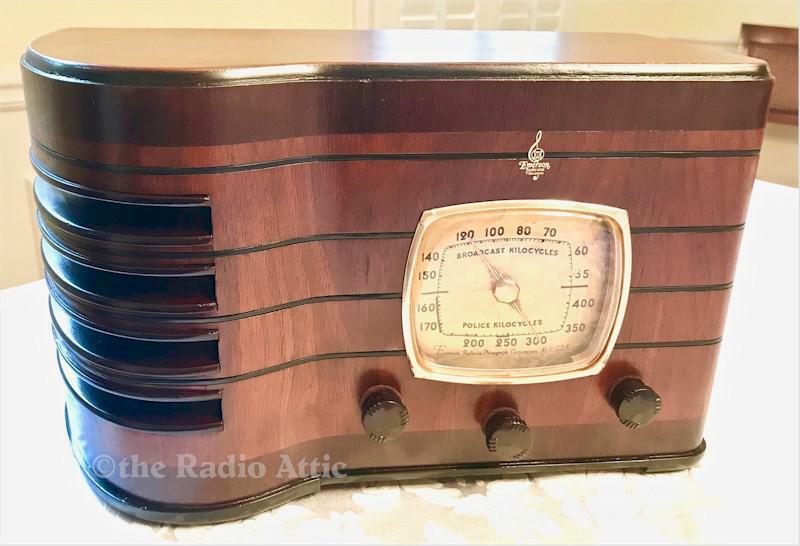 The electronics have been completely restored (no shortcut repairs and it is internally fused for your safety), and it plays very nicely on the AM and shortwave bands. I've added an MP3 input for your listening enjoyment should you wish listen to your own supplied music, such as Doris Day or Ray Noble. 15"W x 9"H x 6-1/2"W.